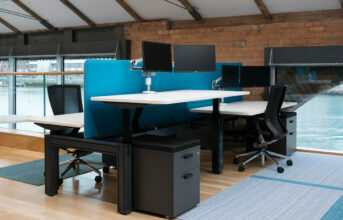 Farrell has developed the Elements range, a unique collection of height adjustable, sit-stand furniture that puts users, ergonomics, comfort and healthy working at the fore. Elements range was the result of a collaboration between Farrell design team and John Walsh of Made, from concept to completion to ensure the perfect system was created. At the core of Elements is a robust yet flexible extruded aluminium framework that can be assembled in multiple configurations to suit almost any of office environment. 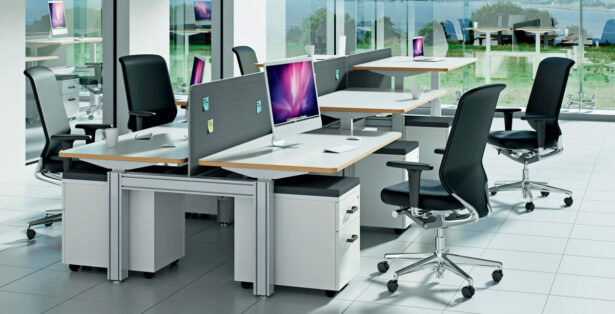 The Elements range features in-built height selection as standard, which means that the work surface can be adjusted to the most ergonomically suitable height for every user in the seated position. In addition, there is the option of including “drop–in” sit-stand module, allowing workers to, at the touch of a button, electronically move their desk from a sitting to standing position. A typical desk job is the everyday norm for most of us, and it means being inactive most of the day. However, neither our bodies nor our physiques are made for this inactivity. Studies show that sedentary behaviour leads to lifestyle related diseases. Using a sit-stand desk can reduce sedentary behaviour significantly, decrease the risk of lifestyle related diseases and increase our daily wellbeing. The Elements range has been developed with a simple, sleek, yet robust design to appeal not only to architects, designers and facilities managers, but also more importantly to the end user.